At the start of December, we relayed news from Spain that Manchester City are regularly following Junior Firpo in action for Real Betis. 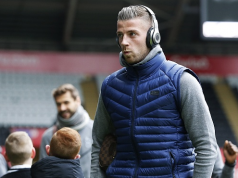 The end of the same month, AS reported the left-back is a ‘priority target’ for Real Madrid, while the Premier League winners and Arsenal are still interested in him, even though he signed a new five-year deal last August. In today’s edition of Mundo Deportivo, it’s explained that Quique Setién’s side fear that they could lose the 22-year-old after the end of the season to either the Champions League winners or Pep Guardiola’s side. The English club have an advantage because the player is managed by Pere Guardiola, the brother and agent of the City manager… but he also took Brahim Diaz to Madrid recently. Betis are looking to bring in a replacement for Junior and have identified Alex Moreno of Rayo Vallecano as a target. 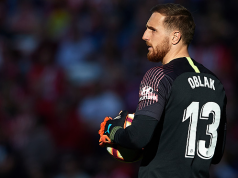 The report claims Los Verdiblancos have even made an offer of €5m for the 25-year-old. 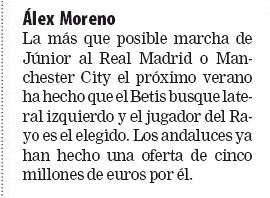 If Moreno joins Betis, it will come as positive news for both City and Real Madrid.